I had this pasta two days ago. It’s very simple. Lots of whipping and sour cream, cumin spiced Gouda cheese, streaky bacon and a splash of red onions and freshly ground pepper. I loved it so much I decided to post it so I can continue making it without wondering what transpired the last time I made it. 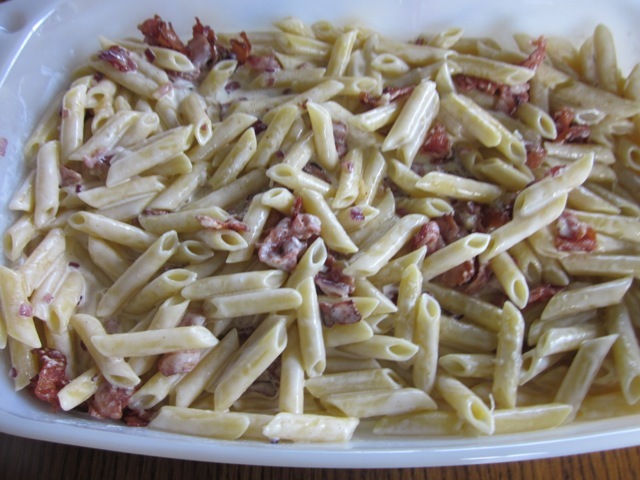 You can use any short pasta that appeals to you. I used penne. I spent this afternoon watching the Brazil-Germany match. I’ve never seen anything like it. One goal after the other, 7 times! At least Brazil got one consolation goal, in the last minutes. If you’re from Germany, I’m sure you spent the whole evening celebrating. I wonder what the streets of Brazil are like. Many fans were crying. If you are from Brazil, my empathy to you, there will be another time. I hope you like this pasta the way we did! Please always assemble all ingredients before you start. Preheat the oven to 400°F (200°C). Boil the pasta in plenty of salted water until almost al dente then drain and rinse briefly under cold water. Set aside. 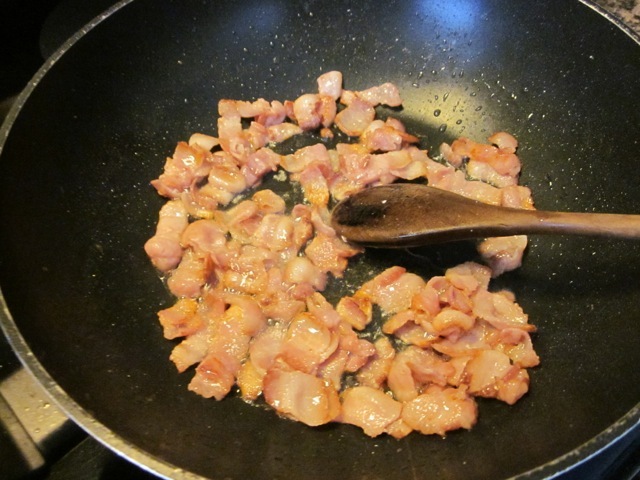 Cook the bacon in a heavy based pan over medium heat until browned (if it renders too much fat, drain most of it). Reduce the heat and add onions and cook gently for 5 minutes. Remove the bacon and onions and set aside. In the same pan add the whipping and sour cream and heat gently. Add the bouillon cube and stir until dissolved. 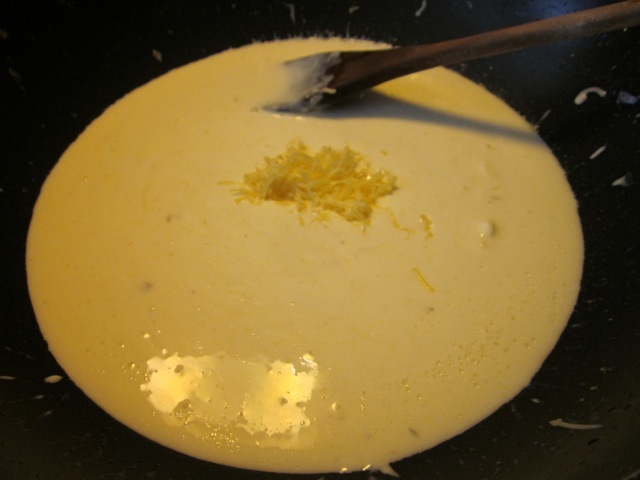 Add half the shredded Gouda and continue heating and stirring until the cheese is melted. Season with salt and pepper to taste. Stir in the pasta and mix thoroughly. and sprinkle the remaining cheese over the top. Bake in the centre of the oven for 15-20 minutes or until cheese is bubbly and slightly browned (I baked for 20 minutes). Preheat the oven to 400°F (200°C). Boil the pasta in plenty of salted water until almost al dente then drain and rinse briefly under cold water. Set aside. 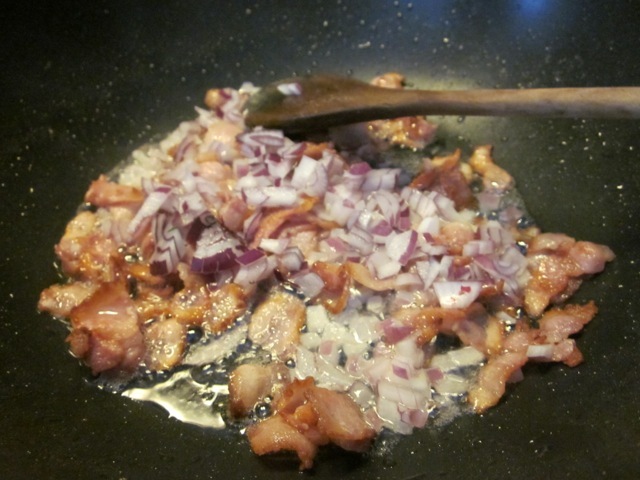 Cook the bacon in a heavy based pan over medium heat until browned (if it renders too much fat, drain most of it). Reduce the heat and add onions and cook gently for 5 minutes. Remove the bacon and onions and set aside. In the same pan add the whipping and sour cream and heat gently. Add the bouillon cube and stir until fully dissolved. 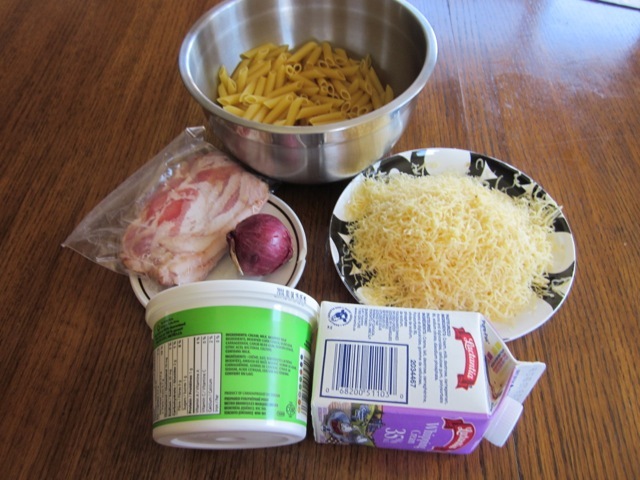 Add half the shredded Gouda and continue heating and stirring until the cheese is melted. Season with Salt and Pepper. 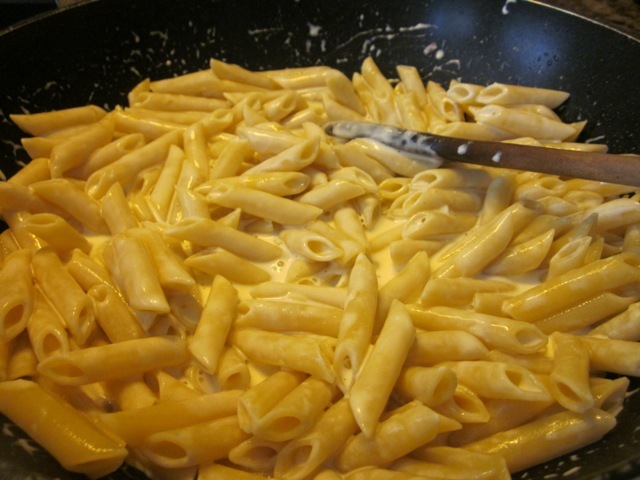 Stir in the pasta and mix thoroughly. Transfer the pasta into a 9 x 13 inch ovenproof dish. 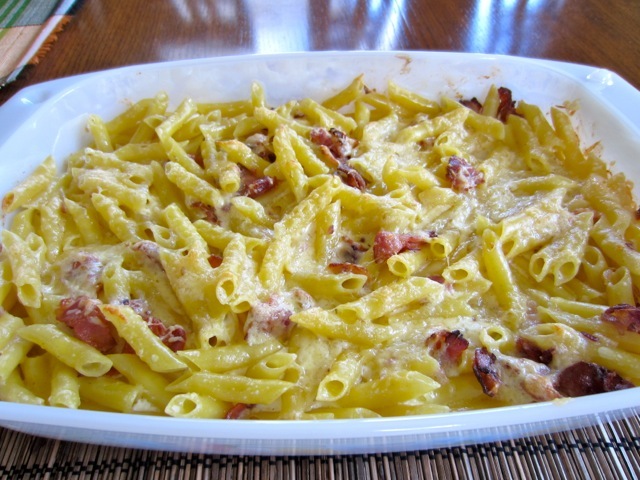 Stir the bacon and onions into the pasta and sprinkle the remaining cheese over the top. Bake in the centre of the oven for 20-25 minutes (I baked for 20 minutes). Give a grinding of pepper and serve hot. 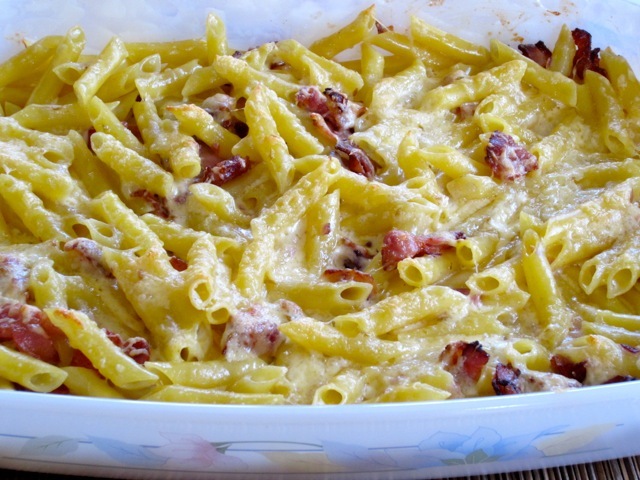 yum – it must have been ages that I made a pasta dish like that. But oh it really does taste so fabulous. I used to throw a handful of frozen peas in there are well…. a handful of peas is a great idea. Next time….some veggies will lighten the bacon. Have a great week! 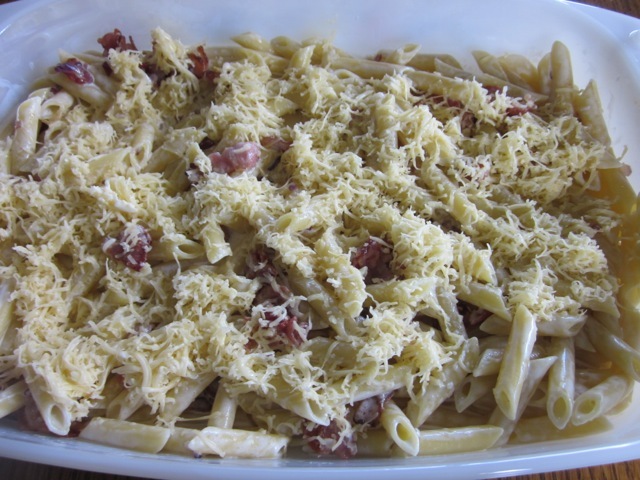 This is one of my best pasta recipes, simple but glorious. July is like a rainy season to us too, no watering the lawn. The glass of wine was tipped over to the right place. Have a great Sunday! You’re on a #YUMM roll! Perfect!! My middle son is the mac and cheese king and he would absolutely love this. Gouda is one of my favorite cheeses, add in the bacon and it sounds so incredibly delicious. Ha ha say hallo to the mac and cheese king. My son loves pasta too, in all forms. I love Gouda too. I’ve got several flavours right now. Have a great week! Anything that begins with ‘lots of whipping cream’ I am totally in for! Oh so you and I are totally sailing in the same creamy boat. I love it!!! I love cheese! Looks extra creamy! 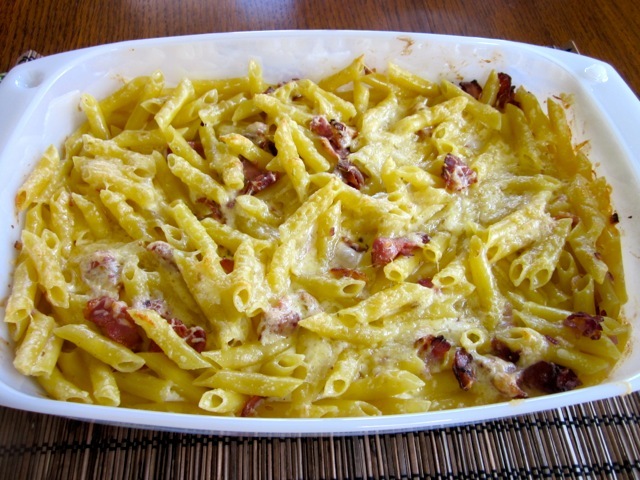 Lovely-sounding recipe (hey, it has cheese and pasta–what’s not to like?!) We watched the soccer game, too–it was painful to see! Thank you. 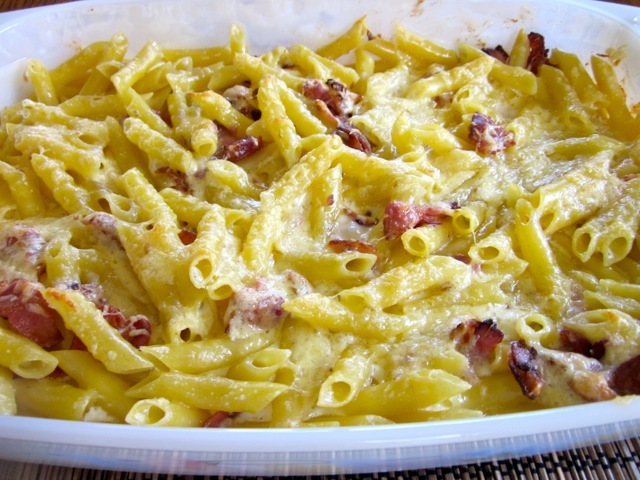 Cheese and pasta is a great combination. LOL I hope the future is here today, or latest tomorrow. Enjoy the dinner! Did someone say bacon? And what about this cumin spiced Gouda? Where did you get that? I think our stores here are just plain stingy. Perhaps it’s that we don’t have the population or the ethnic diversity that we just get plain, bland same old same old! Gosh I was so excited when I was shopping in Mexico to find bags of all these different dried peppers. Brought one in particular home that I like the flavour of – ancho chile. Hmm, haven’t actually used it yet, since I got home. Right now it’s sitting in accompaniment of a huge jar of kafir lime leaves I’ve had for about 2 years! One day…..
Great sounding recipe Liz. Obviously I’m on your side with the pasta recipes! Cheers, and have a great day tomorrow. I laughed so much I even fell asleep. This cumin spiced Gouda came from Schiphol airport in Amsterdam, on the way to Toronto. I have seen smoked Gouda and Jalapeño flavoured Gouda but I have’t seen the cumin one here, either. I do agree with you. Europe has got a wide array of ingredients and better quality too. I lived in Europe when I was a student and life there is so much different and fun too! Can you start using that ancho chilli of yours lest it ends up in a bin some years later. You see the Kaffir lime has been chilling there for two years…ha ha! Funny how human beings want things they promptly forget about! I’m like that too. Our weather here is more like fall, so cool, sometimes I feel a little cold, but I love it. I’m sitting by the window right now sniffing fresh air. Who knows when it will become unbearable again. Have a good day Sandy. I know how much you love cheese. I bought mine in Amsterdam. They are almost finished. Have a great evening! Pasta and cheese? Who could resist!!!!! I snagged a 1.5# package of sliced Gouda a couple of days ago, so it has been falling into almost everything lately. Especially good in cream of broccoli soup, with potatoes, mushrooms, and onions. Oh boy I love Gouda. I have four different flavours right now, Gouda with Cumin; Gouda with Herbs; Gouda Natural; Gouda with Jalapeño….I am having a whale of a time. I have to try the cream of broccoli soup too!